This past Sunday I spent like most Sundays. Doing laundry. Then, doing more laundry. Oh, and also ironing. Let's not forget that. However, in between all my domestic responsibities, I was also able to fit in one of the many tasks on my never ending to do list. I was able to finish lining the drawers of a furntiture piece I recently completed. Yay! Ok, this was not really an exciting task, but I got it done. A couple of weeks ago, I finished a dresser/buffet in a finish I call Two-Toned Glam. The piece came out beautifully in the end, but it had given me little fits here and there. Just little things. For intstance, I talked in an earlier post about having to deal with water marks that had popped up. Another minor, but nevertheless so very annoying, problem with this piece was a drawer which had a stain. 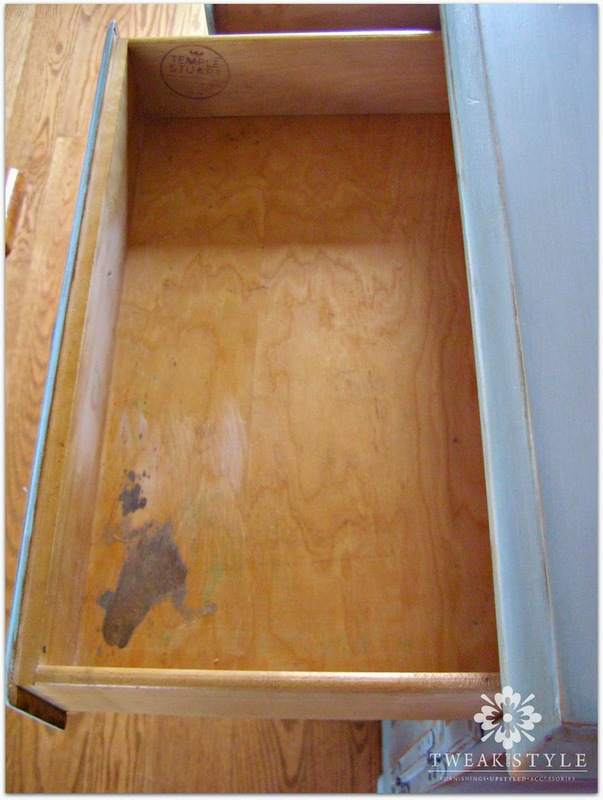 From time to time, I will have a great piece to refinish that may have stains or marks inside the drawers. And, because most of my pieces I sell at my Etsy shop, I want to be sure they go to my customers in good shape. Sometimes, I can clean away marks. Other times, I may need to sand them away. On this piece, however, the stain was too deep and superficial sanding would not work. So, my favorite, and by far the easiest, fix for imperfect drawers is lining them with adhesive cork. This brand I purchase right at Home Depot. 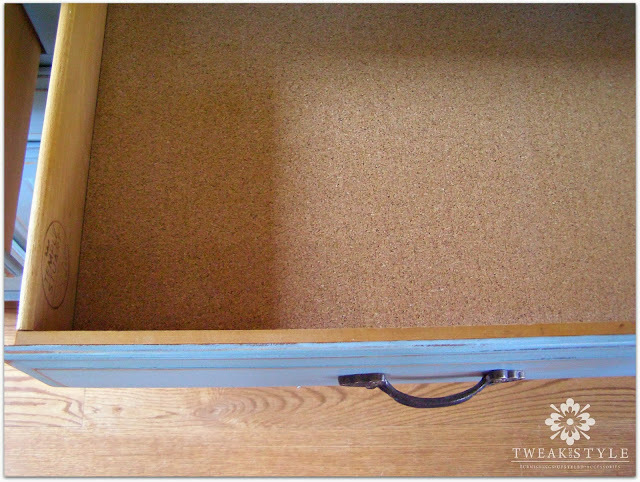 It gives a clean and natural look and for drawers that could see a lot of wear, it is very durable. It also "naturally resists mold and mildew, as well as, cushions and protects"...that there is right off the label! 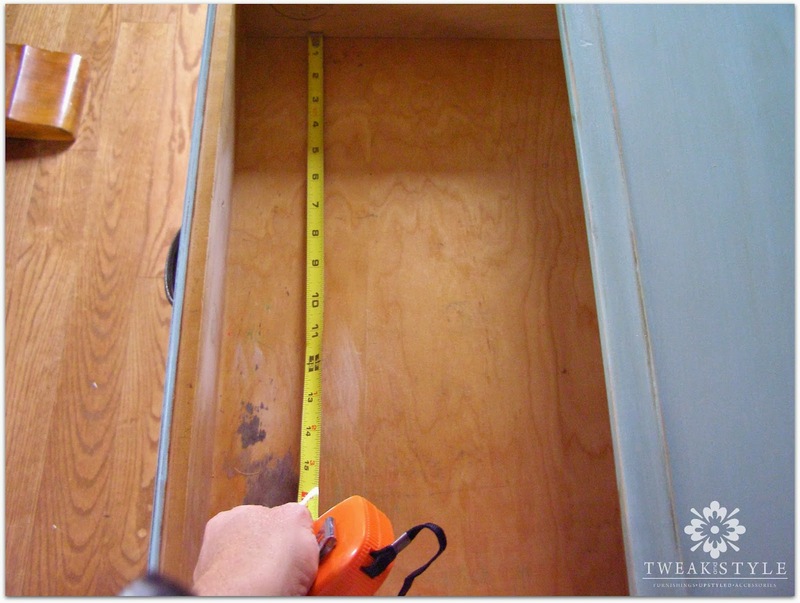 First, I measure the length and width of the drawer. Oh, and take out the drawer to make it easier...which I, of course, did not yet do in this picture. 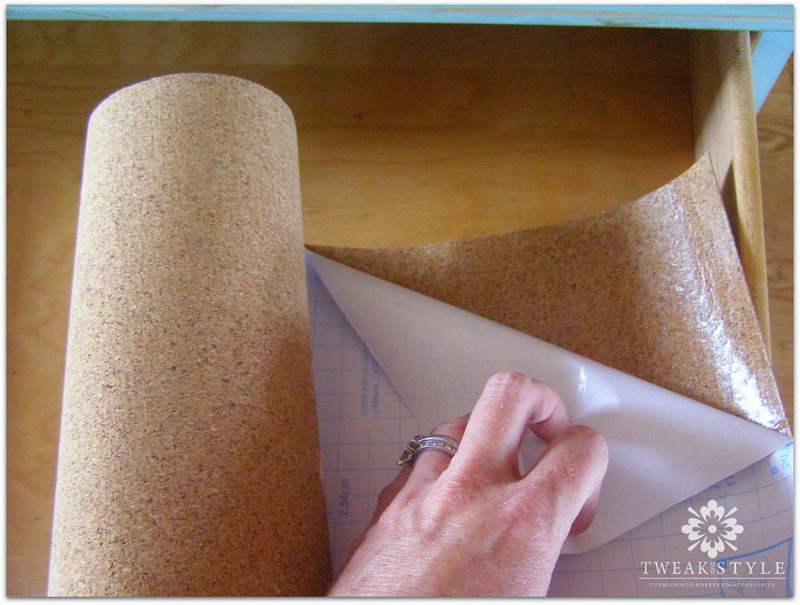 Then, unroll your cork adhesive onto a flat surface and mark off the drawer measurements on the back grid and cut along the lines. Next, peel back one corner of the cut liner and lay the adhesive side down in your selected drawer corner. 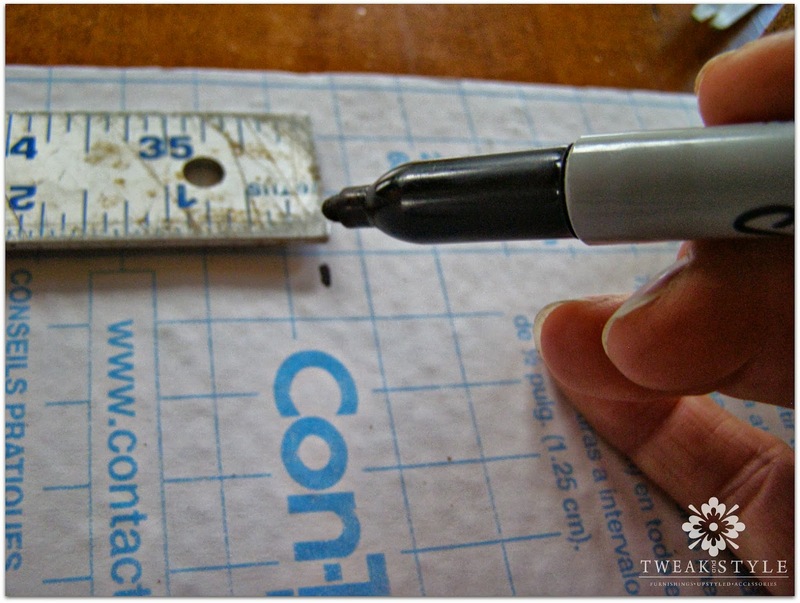 Once your corner is down, slowly pull the white paper off the adhesive back, working from the first corner. 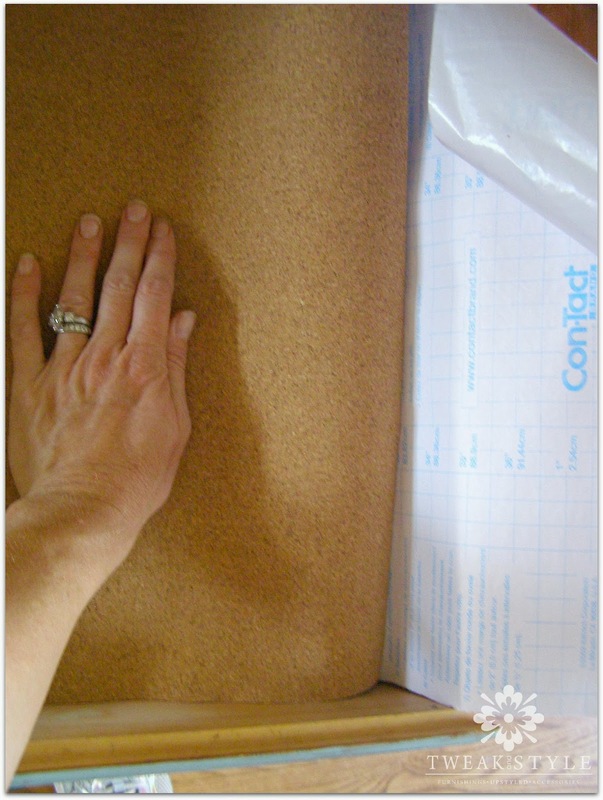 At the same time you are pulling the white paper off, begin pressing down the adhesive side, smoothing as you go. Here is my drawer "after" with the cork liner. 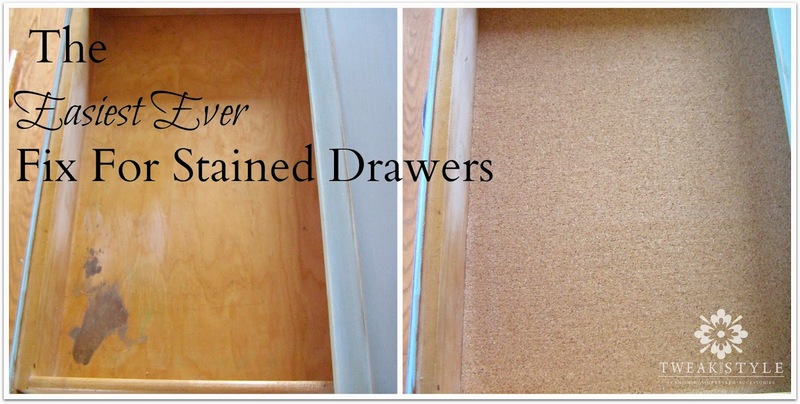 It is a downright pretty inside of a drawer...don't you think? 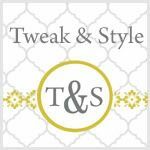 Such a simple but fabulous fix! What a great idea!! It looks wonderful and is so functional. 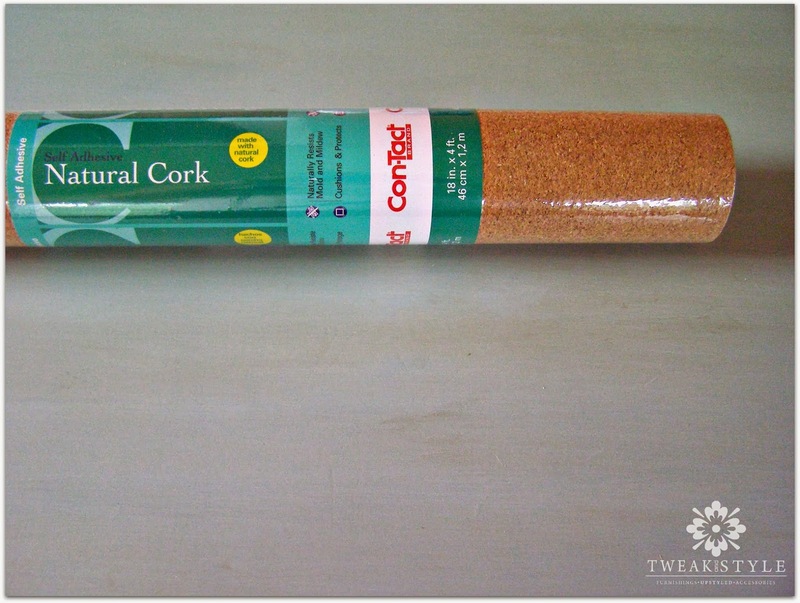 I've never heard of cork contact paper! that is awesome!! !